Kung Fu Chess, as found at https://www.kfchess.com/ is a remake of a much older PC game by Shizmoo games, and has recently been adapted for online play. Kung Fu Chess has the initial setup and most of the same rules as the standard game of queen's chess that everyone is familiar with. The primary difference is that instead of one player moving one piece at a time, a player may move any of their pieces at any time, provided that the peace in question has not been moved in the last 10 seconds. The common video game term for this 10-second refractory period that each piece has after it moves is called a cooldown. 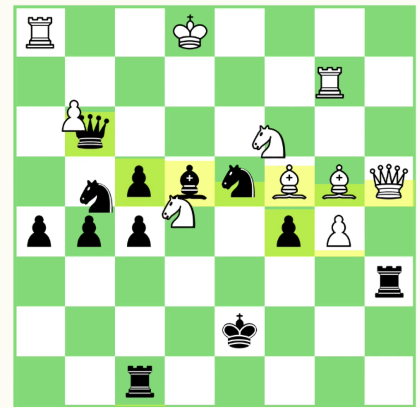 Two consequences of this 'cooldown move' rule are that are a player can leave their king in check, and that the game ends when a king is captured, not mated. The 'end on capture' rule is likely for computational purposes, because testing the condition for checkmate would involve considering each piece's cooldown, and would be either computationally intensive or error-prone. After a checkmate, a capture happens soon after, so it's moot anyways. Several pieces in mid-move. The yellow tint represents cooldown. The removal of the rules surrounding check is more tactically interesting. Moving into check, or moving while in check without resolving check does not automatically give an opponent an opportunity to capture. All the threatening pieces may be on cooldown, and the check may yet be resolved in time. This is especially true when you consider that pieces also move in real time at a rate of about 1 square per second, and that captures happen upon arrival. The king could move out of the way AFTER a capturing move has been initiated. Another consequence of not having checks is that a piece is never pinned in the absolute sense. Furthermore a pinning peace has no ability to threaten or defend itself while it is in cool down. A tactic that becomes less powerful is the fork. A simple example of a fork is when one piece, which is not itself being threatened, is threatening two or more pieces at once. In the classical queen's chess the player subject to the fork can only prevent one of the two threatened pieces from being captured because they can only move one out of harm's way before the forking piece can move again. In a game like Kung Fu Chess where more than one piece can be moved at a time, both pieces can be moved out if the defending player is fast enough. A player can also choose to make no move at all. In fact, if both players are in Zugzwang, (the condition where any move at all produces a worse situation for a player than making no move) then both players can agree to a draw. Castling and pawn promotion continue to work as normal, but en passant does not, at least in this implementation. Finally because both players can make moves at the same time a player cannot know what the board state will be at the end of any given move. As such some information is effectively hidden from a player at the time that they decide to make a move. Without that complete information perfect play cannot be assured regardless of skill, as will be discussed in the next chess variants article. The inspiration for this game was real time strategy games like Starcraft, in which a player commands the individual units of an army, and they respond to those commands in real time. A key element to successful play in a real time strategy game is being able to execute many actions quickly. Doing so leaves fewer of resources idle and vulnerable, and allows for finer, more nuanced play. Likewise in Kung Fu Chess, being able to execute many actions in a short time means keeping many of your pieces on the move from one position to a better one, or at least prevents them from being attacked and captured. Although each piece has the same cooldown time. One could imagine a massive shift in the relative value of pieces just by changing their relative cool down times. The 10-second cooldown interval implies that a player can theoretically make a move up to every 10/16 of a second by keeping every piece active as soon as possible. Because of this, I would recommend Kung Fu Chess to fans of bullet chess. I would personally like an option for a longer cool down to consider my strategy more rather than leave this as a real time strategy frenzy.